We have a counter and cupboard! A few weeks ago, it dawned on us that it would be a good idea to look for a “shed-sitter.” We have been in the process of finding the right fit and yesterday a couple came over and stayed for a couple of hours. I’ll let you know how it turns out. 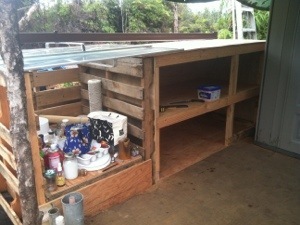 We have spent the past four days building a rat-proof cupboard/box which conveniently doubles as a countertop!